We are witnessing a revolution in food. New technologies will change the way the world eats, expand access to food, and improve the quality of what is produced. But we are also living at a time when dramatic advances in the reduction of global poverty and hunger are being challenged by ongoing conflicts, climate change, and urbanization. Going forward, the conversation around food will shift away from the more mechanical aspects of growing more crops to feed the planet, to the transformational role food plays as a proxy for understanding the political dynamics of international relations. Today food is no longer “stove piped.” Instead, discussions about food now recognize the interconnected nature of food with a very broad constituency of people and organizations. This is transformational. Humanitarians are interacting more with development practitioners to create sustainable food climates after crises. Military strategists are working with conflict experts to prevent further destabilization of countries plagued by war, and the private sector is engaged, using business strategies and impact investments to help address international value chains. Food critics and chefs are searching for ways to bring their knowledge of food preparation into the limelight by using it as a tool for social good. Often these projects seek to alleviate global hunger by scaling up production to help farmers reach larger markets. For students of international relations, understanding the multi-dimensional aspects of food is central to understanding global governance. The issue of food security is not just a matter of feeding the 800 million hungry people on the planet today—it is also an issue of conflict prevention and international cooperation. We have all heard that by 2050 the world will have two billion more mouths to feed. But the real challenge in a globalized world will be fostering equitable access to food if inequality between the global north and south remains rife. Physical phenomena like changing weather patterns, diminishing supplies of fresh water, and increased desertification, make food an essential component of the international relations curriculum. This brief overview does not cover the full breadth of food studies today[i], but by reviewing some of the central issues that make the kitchen the new venue of foreign policy, I hope to familiarize readers with some of the key concepts and themes that are evolving the conversation around food policy, public diplomacy, and the nexus between security and development. Food has entered the security space. In 2015, the National Intelligence Council issued a report on food as a national security concern. While there is no clear direct causation between food access and conflict, food insecurity is now being discussed as a factor that exacerbates other political, economic, and social drivers of conflict. Who has power is often determined by who has land and resources to buy food, and who must work hard for a minimum wage just to have it. Lack of food can also be a consequence of conflict. Food supplies in post-conflict countries often reflect the state of governance since providing citizens with basic needs speaks directly to state capacity. With food security on the national security agenda, international peacebuilding interventions often include delivering food assistance. Food aid can reduce tensions and alleviate the underlying sources of conflict thus fostering unity and trust while building the legitimacy and capacity of the state (Hendrix and Brinkman, 2015). Aid can provide life-saving food during the post-conflict or crisis period and, at its best, aid should work to sustain agricultural supplies, enhance development, and find ways to promote stability and prevent new disruptions of the peace. While the concept of humanitarian aid is relatively straightforward, the implementation and governance of food supplies often creates problems. Assistance and support can disrupt food markets and be used as tools of oppression. Though misappropriation of aid is a series problem, peacebuilding interventions promoting food security may also bring benefits through long-term processes. Inclusivity is crucial if programs are to be properly designed, implemented, and evaluated. If done correctly, food security programs bring together various groups who would otherwise be at odds, and can consequentially build social resistance to violence. Food is also about status and gender. Women comprise the largest percentage of the workforce in the agricultural sector, but often do not have access to or control over land and productive resources. Women are 43% of the world’s agricultural labor force, and this figure rises to 70% in some countries. In Africa, small farmers are responsible for 80% of agricultural production and these farmers are mostly rural women. These women are the most at-risk and face malnutrition and starvation in some sub-Saharan African and Southeast Asian countries. Even when women cultivate the land they are often only allowed the leftovers after the males of the family are fed. Moreover, national laws and lending practices may forbid female land ownership which creates dire economic conditions for women farmers. These facts complicate the cultural dynamics and real political questions country’s face when legislating land ownership and working toward more egalitarian power structures. Food, as a tool to persuade, cajole, and convince, is one of the oldest forms of soft power. A country may show off its “haute cuisine” by hosting events which highlight gastronomic expertise and/or local foodways. Food also serves as a way to promote positive impressions of the host by bringing people around the table—the ancient act of commensality. It is a means to create cross-cultural understanding in the hopes of improving interactions and cooperation (Chapple-Sokol, 2013). Even though the French claim to be the inventors of this type of diplomacy, the practice can be traced to biblical times, the Roman Empire, and Renaissance Italy. 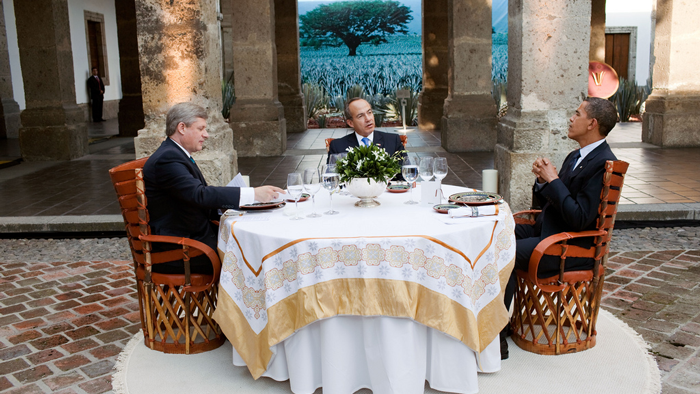 State dinners and meals held during negotiations are examples of culinary diplomacy. A more modern variation would be the United States Chef’s Corps created in 2012 at the Department of State by then-Secretary of State Hillary Rodham Clinton. As part of its protocol office, the United States uses food to illustrate the diversity of American cuisine by inviting famous chefs from around the country to cook for visiting world leaders. The US is also sending some of its finest chefs to cook at overseas embassies to highlight the country’s culinary talent. If culinary diplomacy takes place at the highest levels of government, gastrodiplomacy is the people to people equivalent which employs the diverse cuisines of ethnic communities to educate the palates of ordinary citizens by bringing new cuisines and flavors to others. Gastrodiplomacy is a way to help people understand the foodways of other cultures in a positive way (Rockower, 2014). Diaspora chefs use their skills in the kitchen to win hearts and stomachs by preparing national foods. It is a form of cultural engagement. Food trucks are one of the most visible manifestations of gastrodiplomacy, as are ethnic restaurants which translate the foods of diverse cultures to American tastes. Gastrodiplomacy is really a two-way process of introducing new cuisines into the American kitchen, while also serving more recent immigrants a taste of their homelands. Often these foods provide a deeper connection to place and culture when returning home is not an option. Sociologist Krishnendu Ray (2016) notes that food is a vehicle for what you left behind and for what you are entering into. Today both culinary diplomacy and gastrodiplomacy are what Professor Joseph Nye has termed “soft power.” Soft power is the ability to shape the preferences of others through appeal and attraction (Nye, 2004). A defining feature of soft power is that it is not coercive. The currency of soft power is culture, political values, and foreign policies. It is part of the intangible cultural heritage of a country. Countries and their citizens can use national cuisines to influence public opinion and gain positive public opinion. By highlighting a country or city’s special attributes with the goal of gaining greater recognition on the global stage, this type of approach has been especially effective when food becomes the center of a marketing plan (Pham, 2013). When a nation’s culinary heritage is combined with an excellent cuisine, there is also the possibility of getting the attention of the international community. Many middle powers, like Peru and Mexico, have had their cuisines designated intangible cultural heritages by the United Nations Educational and Cultural Organization (UNESCO). More recently Japan, India, and Indonesia have leveraged their foods as part of their national brands as a means to promote tourism (Bestor, 2014)[iii]. Other countries, like South Korea, also use their national dishes to promote agricultural exports (Pham, 2013). Thailand is another country using food as a tool of place branding. The government funded a multi-year campaign, the Global Thai program, to raise awareness of its food culture by offering citizens living outside the country funds to open Thai restaurants and gain access to Thai food products for import. Between 2002 and 2005, the number of Thai restaurants globally increased from 5,500 to 10,000. By creating a Thai brand, the government made an exotic cuisine part of a more everyday food experience that people in the West could appreciate. Once again, this program shows that restaurants are becoming cultural outposts by helping others become more familiar with the tastes and smells of other cuisines. We know that food’s relationship to conflict is complex and multidimensional. But it is only recently that the world of food-agricultural sciences, war and diplomacy in providing humanitarian aid and building peace have all become part of the larger inquiry into how food is both a tool to communicate culture, but also central to shaping conflicts and their impacts on civilians. It is neither anthropology, nor history, nor development economics, but a field that is emerging as an interdisciplinary approach to the nexus of food and war. Over the last three years I have looked at the cuisines of conflict nations and diasporas in Washington, D.C. to learn more about the ways those fleeing war, or those seeking to rebuild their lives, can also carry with them over thousands of miles the tastes of foods that may be their only remaining connections to their homelands (Mendelson-Forman and Chapple-Sokol, 2014). In creating the concept of conflict cuisine, I have been able to understand the power of food as a tool of peacebuilding. It is a Washington, D.C. cliché: you can tell where in the world there is a conflict by the new ethnic restaurants that open in the metropolitan area[v] . Starting in the mid-1970s, the Vietnamese diaspora, now in its second American born generation, still retains a stronghold on the local Asian cuisine in the city. Similarly, refugees fleeing El Salvador and Guatemala during the conflicts of the 1980s have also settled in Washington bringing with them their most popular foods including pupusas and tamales. Afghans who fled their country in 1979 after the Russian invasion also brought their Central Asian specialties and introduced basmati rice − something many take for granted today. Washington also boasts the largest Ethiopian population outside of Addis Adaba; there are hundreds of Ethiopian restaurants that are as popular with that diaspora as with American millennials seeking out their vegetarian and vegan dishes. The United States is blessed with a diversity that has made it stronger as a nation. This diversity is often manifested in the many foods made possible by the country’s immigrant populations. Not only are diaspora restaurants places for newcomers to find a taste of home (one anthropologist referred to them as “living rooms of the homesick”)[vi], but these business establishments have become important tools for community integration. Conflict cuisines have also become a way to help us understand the power of food as a bridge to greater understanding and communication among different groups who seek to not only earn a living, but also to share one of the most tangible parts of their cultures—their foods. Unfortunately, in the US as elsewhere, recent anti-immigrant rhetoric is stifling refugee reintegration. In the long-run, however, new groups will eventually join the ranks of their predecessors and ensure that conflict cuisines are a strong component of the country’s cultural toolkit. Projects like Peace Meal Kitchen, a Detroit incubator and dining space created by a Palestinian woman, are credited with helping to encourage understanding and communication among diverse ethnic groups. The unfolding refugee crises arising from conflicts in Syria, Iraq, and Libya have made clear the importance of food as a tool for building connections with new places. Immigrants with culinary skills can often get work because language skills are not as important in the kitchen. In Europe, articles appear almost every day about the integration of foreign chefs into the kitchens of their new cities. Food is also used to help mitigate some of the isolation that refugees feel during the resettlement process. In both France and Germany, many groups have started projects to bring communities together around the table. In Sweden, a language teacher who helps refugees learn Swedish started hosting meals which bring together Swedish students and refugees as a way to foster interaction. Recently, social entrepreneurs are creating social capital by working to link chefs with troubled youth to help them learn and leverage culinary skills and launch new careers. There is a strong desire among chefs at the top of their game to work toward helping others. Food is a powerful, easily translatable medium. The dean of this type of work is Italian chef Massimo Bottura, whose restaurant in Italy was listed as the best in the world in 2016. Yet Bottura also works with youth and others less fortunate to feed the hungry and recycle food waste. Most recently he worked in Brazil with Chef David Hertz of Gastromotiva to build on Hertz’s successes bringing youth from the favelas of Rio into the kitchen. The pair solicited equipment and cash donations, and they convinced the city’s mayor to allocate space for the chefs to transform Olympic Village caterers’ discarded products into five star meals for the homeless. Food is a powerful tool for chefs who want to use their skills to help people in need. In Haiti, world-renowned chef Josés Andrés developed World Central Kitchen which provides culinary training to help locals rebuild their country after the devastating 2010 earthquake. [vii] This project has led to similar efforts in the Dominican Republic, Nicaragua, Zambia, and Cambodia. These projects produce ripple effects as they empower young people to find ways to use their skills to bolster their communities and promote social inclusion. [viii] In Peru, Chef Gastón Acurio, who put Peruvian cuisine on the map as a national brand, has also opened a training program for young people who are getting a first rate education at his Pachacutec culinary school. Culinary skills are a springboard to economic success for those living in poverty or in marginal areas. Social innovators and project funders are becoming increasingly aware of how culinary training unleashes entrepreneurial skills and serves those seeking a better life (Botero et al., 2016). The food revolution is one that has no borders. It is impossible to think about food as merely an essential for survival. Diverse communities are now thinking about food in ways that had not even been considered before. Food is an important aspect of national security, social entrepreneurship, and peacebuilding. Its relationship with disruptive technologies − such as those that have made it possible to invent proteins or plants which contain their own pesticides − are combining the expertise of business and science with policymakers. These advances make food shortages less likely as agronomists figure out ways to increase yields in light of climate change and the rise of megacities. This integrated approach to such an important and popular subject makes food a lens through which to view the world. Food has become a powerful tool of peacebuilding. It is being used to support inclusion and reintegrate refugees. Food gives diplomacy a boost by allowing countries to market agricultural products through nation-branding, and world-famous chefs are now offering up their talents to promote social good. Chefs are among the new social entrepreneurs trying to change the world. What is clear from this brief survey is that food will remain a topic that is no longer limited to the kitchen. It will continue to enter classrooms and policy discussions. Ultimately, food will become part of a common global language that does not get lost in translation thanks to the attention it is receiving from a new community of scholars and practitioners. [i] For an excellent review, see Belasco, W. (2008). Food: The Key Concepts, Bloomsbury: New York. [ii] Chapter I, Introduction-“Food and War” in which Collingham estimates that at least 20 million civilians’ deaths were attributable to starvation, approximately the same number of fatalities as military deaths during the Second World War (roughly 19.5 million). [iii] In 2003, UNESCO established the Convention for the Safeguarding of the Intangible Cultural Heritage. By 2010, it had added food to this category when it recognized French cuisine, along with Mexico and Croatian gingerbread craft. [iv] Adriana Valverde’s talk was given as part of The American University School of International Service’s Conflict Cuisine Project. www.conflictcuisine.com. [v] In the Conflict Cuisine course I teach on this subject at American University, I use the lens of food to teach students about conflict and diaspora. This lens helps put focus on the intimate connection between climate, water and agriculture, and it also exposes what happens when fighting starts and the agricultural cycle is disrupted. [vii] Chef Brian MacNair has run the Haiti program. [viii] In Haiti, for example, chefs use their new skills to establish local eateries that then donate their proceeds to local charities. Belasco, W. (2008). Food: The Key Concepts, (New York: Bloomsbury). Bestor, T. (2014). “Most Flavored Nation Status: The Gastrodiplomacy of Japan’s Global Promotion of Cuisine”, Public Diplomacy Magazine, Issue 11, (Winter): 57-63. Botero, A., Estévez, S., Cestari, M., and B. MacNair (2016). “The Power of Gastronomy to Transform Social Realities,” Panel discussion at the XIX Annual CAF Conference (Washington, D.C: September 7-8). Chapple-Sokol, S. (2013). “Breaking Bread to Win Hearts and Minds,” The Hague Journal of Diplomacy, Issue 8, 161-183. Collingham, L. (2012). Taste of War: World War II and the Battle for Food, (New York: Penguin). Hendrix, C. and H. Brinkman (2015). “Food Insecurity and Conflict Dynamics: Causal Linkages and Complex Feedbacks,” Stability: International Journal of Security and Development 2(2): 20-26. Mendelson-Forman, J. and S. Chapple-Sokol (2014). “Conflict Cuisine: Teaching War through Washington’s Ethnic Restaurant Scene,” Public Diplomacy Magazine, Issue 11, (Winter): 21-26. Messer, E. and M. Cohen (2008). “Conflict, Food Insecurity, and Globalization,” International Food Policy Research Institute, Food Consumption and Nutrition Division. Nye, J. (2004). “Soft Power: The Means to Success in World Politics,” (New York: Public Affairs). Pham, M. (2013).“Food as Communication,” Journal of International Service, Issue 1, (Spring): 1-22. Ray, K. (2016). The Ethnic Restaurateur. Bloomsbury Publishing. Rockower, P. (2014). “The State of Gastrodiplomacy,” Public Diplomacy, Issue 11: 11-14. Valverde, A. (2015). “Culinary Diplomats and Nation Branding,” Is the Kitchen the New Venue of Foreign Policy: Ideas on Food as a Tool for Diplomacy, Building Peace and Cultural Awareness. Conflict Cuisine Project Report: 23-24.